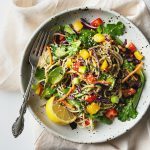 Whenever I feel like I need to eat more vegetables but I’m having trouble getting in the mood for a salad, I’ll often use a couple of “salad tricks” to get myself psyched up. 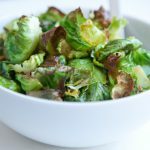 The first “trick” is to add a more comforting component to my bowl of greens, whether that’s some cooked quinoa, brown rice, or in this case: a warm roasted vegetable. The second “trick” is to change up my salad dressing. I’m guilty of getting into a lemon juice and extra virgin olive oil rut because it’s super easy, healthy, and I’m personally not big on heavier ranch-style dressings (vinaigrettes are more my thing). But even the small addition of a fresh herb or one new ingredient can take a salad from “meh” to a meal that makes my taste buds excited again. 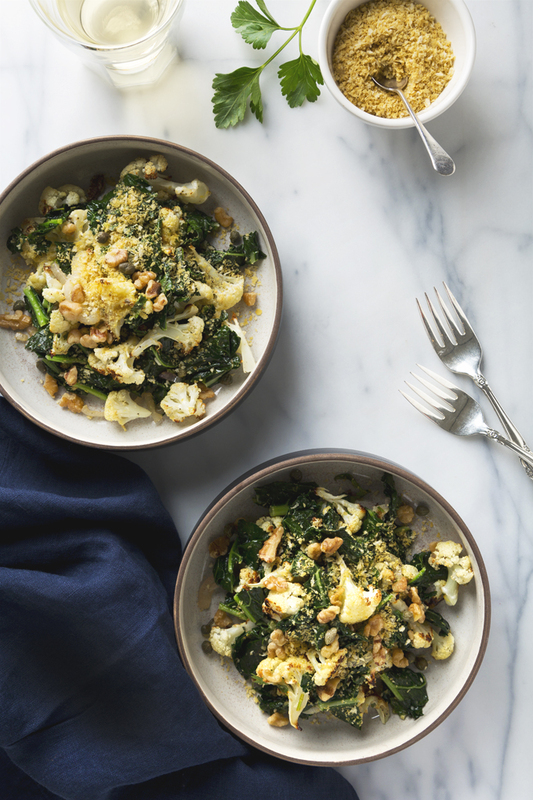 Today’s cauliflower and kale salad has both of those things going for it—warm roasted cauliflower and lemony sautéed kale with garlic and shallots, and my go-to lemon/olive oil dressing jazzed up with fresh parsley, salty capers, and chopped walnuts. It also has a cheesy toasted panko bread crumb and nutritional yeast topping that’s so good, I can’t help but sneak bites of it straight out of the mixing bowl before it even makes its way onto my salad. 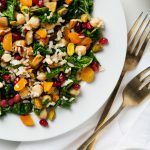 If you’re finding yourself in a salad rut and you’re looking for an easy way to change things up, this warm cauliflower and kale salad is great as a lighter meal, or served with baked tofu for extra protein. 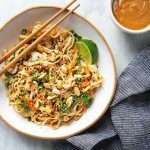 All you need to do is pop some tofu in the oven with the cauliflower for a satisfying lunch or dinner that’s on the table in only 30 minutes. Warm roasted cauliflower and lemony sautéed kale with garlic and shallots. 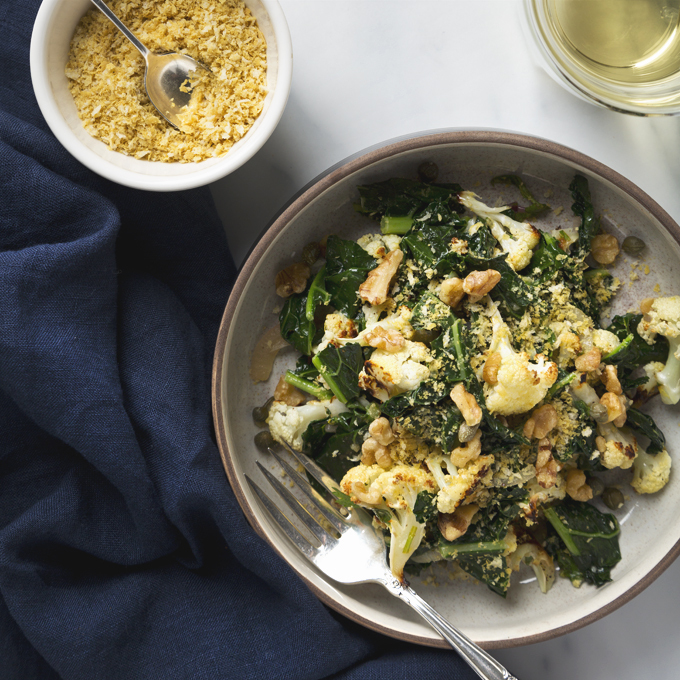 This quick kale salad has a simple lemon olive oil dressing and a cheesy breadcrumb topping that you'll want to put on everything! 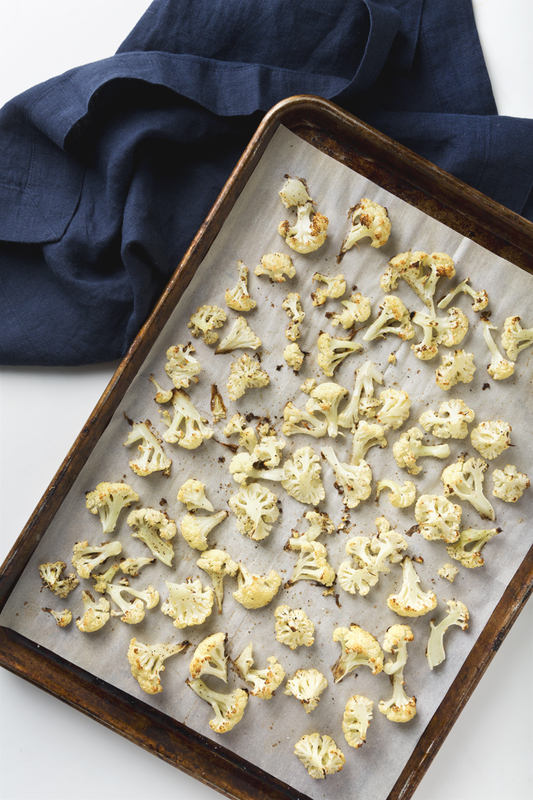 Cook the cauliflower: Line a large baking sheet with parchment paper. Place the chopped cauliflower on the baking sheet. Drizzle with olive oil, then season with salt and pepper. Toss to coat. Arrange in a single layer and roast for 20 minutes, or until fork-tender. Once cooked, transfer to a large mixing bowl. Make the cheesy breadcrumbs: While the cauliflower cooks, heat a medium non-stick pan over medium heat. Add 2 teaspoons of olive oil, the breadcrumbs, and a pinch of salt and pepper. Stir for 2 minutes, until lightly toasted. Transfer to a small mixing bowl and stir in the nutritional yeast. Wipe out the pan. 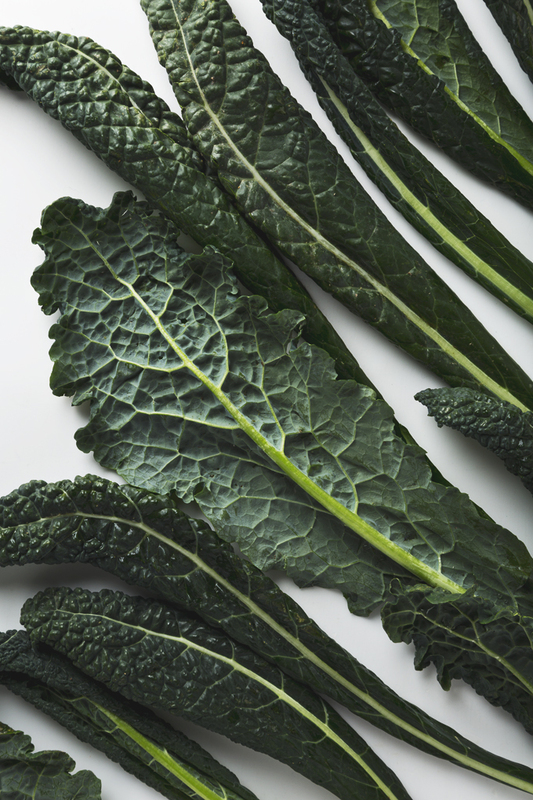 Cook the kale: Add 2 teaspoons of olive oil to the pan (keeping it on medium heat), followed by the shallot, garlic, and a pinch of salt and pepper. Cook, stirring often, for 2 minutes, then add the kale and water. Cook, stirring every so often, for 3-5 minutes, or until the kale has wilted. Add salt and pepper to taste. Turn off the heat and transfer to the bowl of cauliflower. Stir in the lemon zest. Make the dressing: In a small bowl, whisk together the 2 tablespoons of olive oil, juice of 1 lemon, parsley, and capers. Divide the cauliflower and kale mixture between 2 bowls. Top with cheesy breadcrumbs, walnuts, and dressing. We sometimes like to serve this salad with baked tofu for extra protein. All you need to do is pop some cubed and lightly seasoned tofu on a parchment-lined baking sheet and bake it with the cauliflower. I’m so with you on not being able to do ice cold lettuce (unless it’s super hot outside). I need it to be room temperature! cauli + kale together is a heavenly combo..im not into ranch type dressing either so yes lemony vinaigrette is perfect. This looks so good! I love roasted cauliflower in salads. You guys are absolutely wonderful! This salad is absolutely beautiful! I am obsessed with roasted cauliflower and the tangy capers are a genius addition! I added a spoonful of tahini to the dressing for a bit of creaminess which was lovely – a new weeknight staple thank you!! Beautiful salad! I replaced the cauliflower with a mix of wild mushrooms and upped the garlic. The croutons are fantastic as well 😀 Thank you so much for such a lovely addition to our staple dishes!